After the exuberance and spectacle of her Super Bowl performance, Katy Perry stripped it back for her showing at the 2015 Grammy Awards. Going back to her pre-Pop, Christian roots, the Diva delivered a vulnerable performance that sought to silence critics who accuse the Diva of leaning on gimmicks to distract from her (lack of) vocal ability. 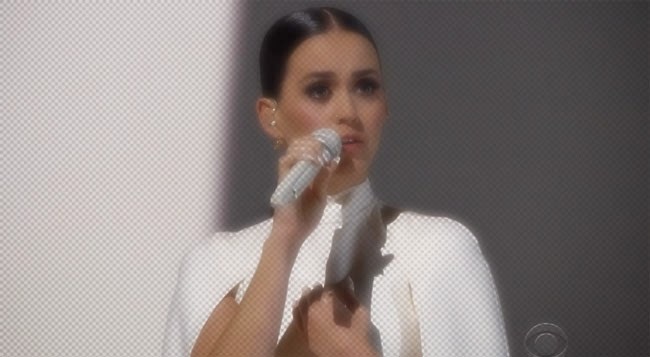 It certainly showed a different side to her voice- sorta sounding like a hybrid of Alanis Morissette and Sarah Mclachlan- but it came as little surprise to someone who has watched Katy Perry The Movie: Part of Me. (Don't judge, I was not in control of the Netflix selection). By The Grace Of God isn't my favorite song, nor was the vocal anything spectacular, but I'm sure it'll make some think twice about the Diva's ability to sing live. And I think that was the point.